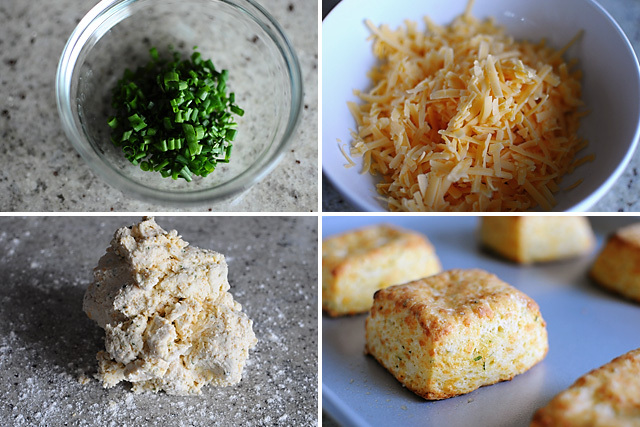 It’s a recipe for their cheddar and chive biscuits, which they serve before the meal. I’ve had it tucked away for a long time, but I finally got around to trying it out. Even with the recipe in hand, it took me a few tries to get these biscuits right. They could only fit so many words on that tiny tag, so the recipe is really vague and unfortunately missing a step–the step explaining what you do with the dough before you put it in the oven. Then I tried the method that Heidi Swanson used on her Yogurt Biscuits in her book Super Natural Every Day. It required me to use a food processor, cut and stack the dough multiple times, and then bake them in a very hot oven on a preheated baking sheet. It totally worked! 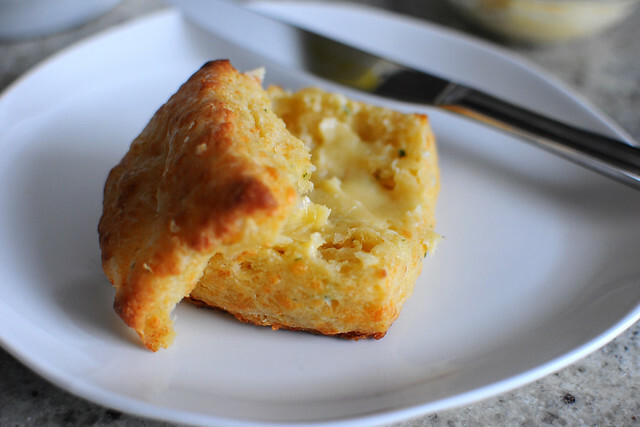 The end result: the lightest, fluffiest biscuits you will ever have. And if you have time to make the Sea Salt and Maple Butter, you should. 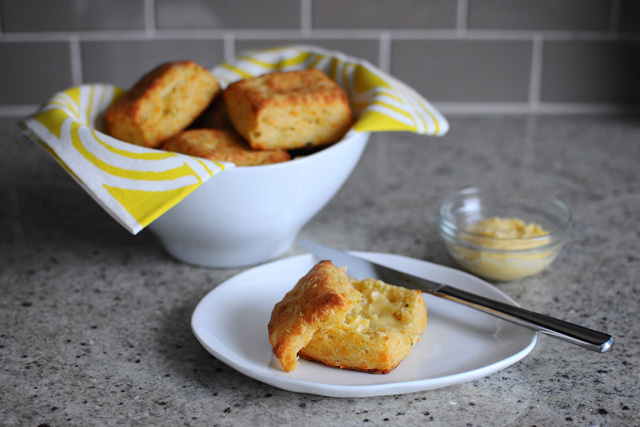 The sweet and salty combination in the butter makes these biscuits even more delicious. Using good cheese counts in this recipe. 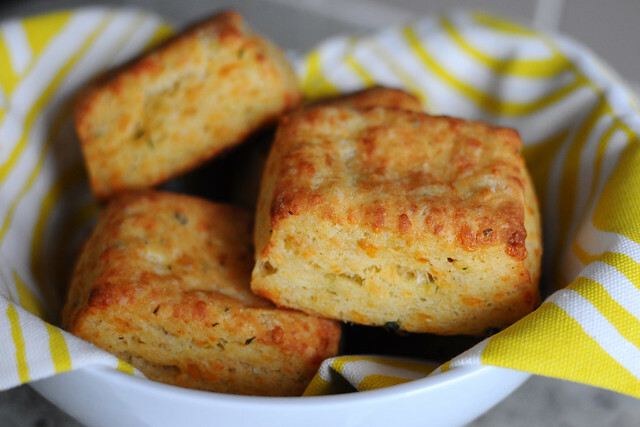 Get a hunk of good quality sharp cheddar and grate it yourself for these biscuits–it makes all the difference. Heat the oven to 450 degrees with the rack in the middle position and place a clean ungreased baking sheet in the oven to preheat too. In a food processor, pulse the flour, baking powder, salt, and cayenne pepper together until well mixed. Add the butter, chives, and cheddar and pulse about 20 times, until there are tiny pebbles of butter throughout. Add the cream and pulse a few times until the cream is incorporated and the dough just comes together. Be careful not to overmix the dough at this point, a few dry patches are fine. Turn out the dough on a clean lightly floured counter and knead a few times to bring it together. Then pat the dough into a 1-inch thick square. Cut the square in half and stack the halves on top of each other. Repeat this process 2 more times—flattening the dough, cutting the dough, and stacking the dough (adding flour as needed). Then press or roll out the dough to a 3/4-inch thick rectangle and cut the dough into 8 even squares with a sharp knife. Transfer the biscuits to the hot preheated baking sheet and bake for 14 to 16 minutes, until the tops and bottoms are a deep golden color and the biscuits are cooked all the way through. Serve hot or warm with sea salt and maple butter (recipe follows). My recipe card from BLT Fish says to serve the biscuits with “sea salt butter and maple syrup.” I decided to make a compound butter with sea salt and maple syrup instead. Any leftovers are great for toast, bagels, and whatever else you can think of! Mix all ingredients together in a small bowl. Serve butter at room temperature for maximum spreadability. Store leftovers in the refrigerator. These just look AMAZING! I am salivating just looking at the photos. It’s great that you managed to perfect the simple recipe you were given. I have printed your recipe and will have to give it a try sometime soon. Yay! Someone finally figured out what was missing from the BLT fish cheddar chive recipe. I followed the original recipe a few times and it was always turned into something like a huge oil spill in the oven (never looked or tasted like the ones from BLT fish) I hope to try your version soon. The proportions of heavy cream to flour is way higher than all my other biscuit recipes but you seem to add lots more while cutting and stacking which will probably help. Hi Angela! I actually do suspect that the ingredient amounts were a misprint or something since I had similar struggles to you. 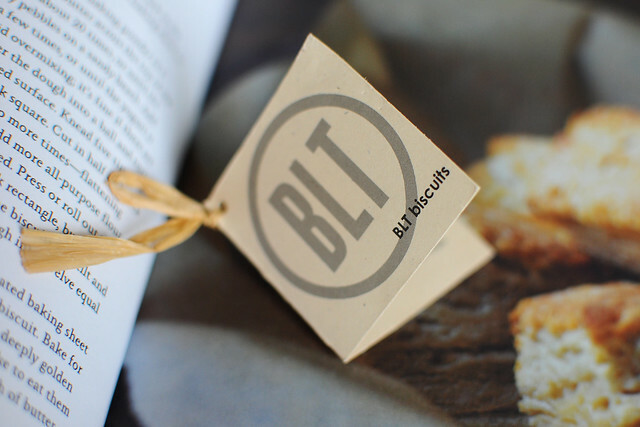 I still stuck to the ingredient amounts on the card and just changed my method, but I’ve thought about trying a batch with more flour as well so that they could be drop biscuits or cut out with biscuits cutters. My memory really fails me when I try to remember what they were like at the restaurant, but I suspect the ones at the restaurant were denser. Let me know how it goes if you try this version! Hi Lana, Great question! I use all butter because shortening is an ingredient that I do not like to use. As a rule, I stay away from hydrogenated oils and highly processed ingredients–shortening being one of them. Hope that makes sense!